The project will focus on the development of a teacher guide offering examples for a wide variety of approaches to history teaching, its dissemination and its implemen­ta­tion by in-service train­ing and History Teachers Associations. 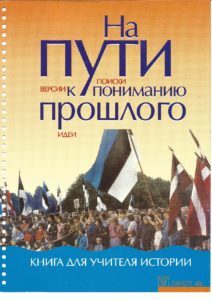 Every history teacher in Estonia and Latvia will receive a copy of the teacher guide. The new stan­dards for history education in Estonia and Latvia require alternative approaches for history education. In these standards a wide range on content-based criteria are merged with modern approaches. During the project, the participants can find out by experience how far it is possible to work with these new guidelines. As a result the standards will be evaluated. The project will develop practical examples of ways of teach­ing, using historical topics, which merge with the tradi­tional cur­ricu­lum. The project will also focus on the integration of minority teachers of history into the History Teachers Associations and their network. To select appropriate aims and objectives from the national standards so that they become achievable within the constraints of the hours available for teaching, and in respect of class size, age and ability. To develop history education through producing guidance on ways of teaching two different topics. The approaches will blend traditional methods of convey­ing knowledge about the past with new approaches to history teaching which are designed to promote democratic values and critical thinking. To develop a range of assessment techniques for different approaches used in the materials and guidance. To produce materials which enable teachers to promote democra­tic practices, human rights and the rule of law. To share good practice in history teaching and to co-oper­ate and exchange ideas with an open mind. To strengthen Associations of History Teachers in the relevant countries. To support the love of learning history through a multicultural, multi-perspec­tive approach and open horizons to museums and field study activities. The Methodological Centre for Latvian History Teachers Association has been founded. Ability to organise the seminars and presentations. Ability to use office equipment and ICT. Ability to draw in resources and organise new projects. Rosemary Rees, Sue Bennett, Ronald Donk, Ian McKellar, Harald Frode Skramm, Sirkka Ahonen. Juris Freibergs, Jolanta Klisane, Elvira Vilume, Sarmite Goldmane, Jelena Rjazanceva, Ligita Straube, Ülle Kõiv, Heli Aiaots, Eda Maripuu, Ivo Maripuu, Mart Kand, Eero Medijainen.